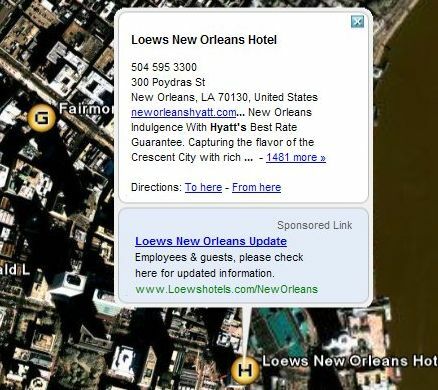 Here's an example of the type of ad Google is experimenting with in Google Earth. Only a random sample of GE users will have a chance to see these ads (I have not yet seen one) with the new version (v3.0.0739) of Google Earth. In my opinion, this type of ad is perfectly acceptable. Those of us who read the Google Earth Community forums should be comfortable as they look exactly like the ones we see in the forums. This type of ad would only appear in the description bubble for businesses you search for in the Local Search, or for certain layers (like "Lodging"). So, they are not "in your face" type ads. I'm sure there are other types of ad formats Google is experimenting with. Also, as I previously reported, if you use the PLUS version of GE, you can apparently turn these off. Thanks to 'esterrett' at the GEC for posting the snapshot shown here. If anyone else sees other kinds of ads, please post them in this same thread to let others see.